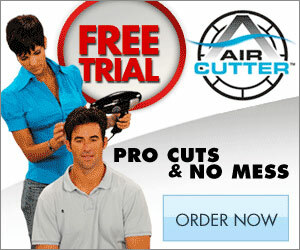 Air Cutter- the professional home styling system. Cut your hair with ease in the comfort of your own home. Watch the video by clicking the link below to see how easy it is to cut your own hair now. No mess and it’s quick and easy. You can try it out free for 30 days to see if you like it. You’ll also get a free style guide as a gift along with a 90 day warranty. It’ll pay for itself in just 1 use!